New CD! - Available Now! Springtime Greetings Friends! Thanks to all you good folks for coming out to our winter and early spring shows. Great to see you all and share some good times together. Our 2019 spring schedule is filled with exciting events we are really looking forward to and hope to see you at as well. 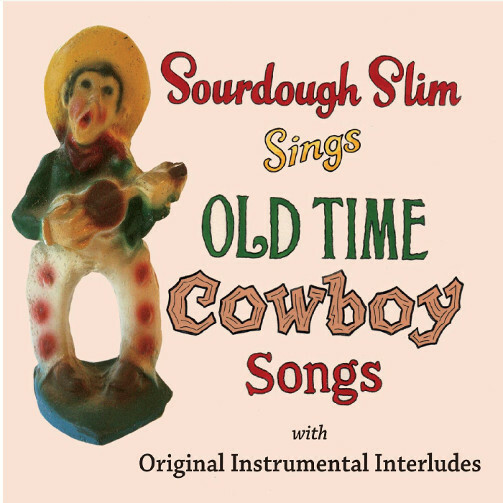 Sourdough's new CD "Old Time Cowboy Songs with original instrumental interludes" is available now. Come and get it! The new CD features some great traditional cowboy classics intertwined with cool original instrumental pieces. Some fine accompaniment from Mr. Armstrong as well. Go to the CD page of this website. Besides celebrating the release of his new CD, Sourdough will be returning this spring to some of his favorite events and venues. April finds the Doughman in So Cal for a kickass 3 days at Altadena's celebrated Coffee Gallery Backstage and the Santa Clarita Cowboy Festival. May brings flowers in the Ozarks as the Slimster returns to the Spring Planting Festival and then a first time performance at Bishop's Mule Days and ends with Mr. Armstrong joining in along with Antsy McClain and the Trailer Park Troubadours at Woodflock 10. June includes a couple of low key but very rare chances to catch the Doughman off guard at shows in Durham and Wheatland, Cal. Take a chance. Life is short. But, whatever you end up doing this Spring, have a good one and please keep our shows in mind. We'd love to see you! A lot of fun stuff coming up. Please join us! Check out the "Tour Dates" page of this website for a complete listing and details of all the exciting up coming performances. And check back from time to time as new shows are being added weekly. We look forward to seeing you soon and sharing some great songs, laughs and good times. Big 2014 Release, "Best Of - Vol. 2"
27 Whopping Favorites from 2004-2013! In early October, Sourdough had the opportunity of a lifetime, working with legendary four time academy award winning sound designer Ben Burtt. (Star Wars, Indiana Jones, Wall-E) Ben is working on a project at Lucas Films Skywalker Ranch that needed some singing and yodeling. Naturally, only the best would do, so he immediately set up a recording session with the Slimster. Working with Ben was a wonderful experience. After recording mega yodels and song in the Skywalker Sound Studios, Ben took Sourdough and his son Carson on a personal tour of the ranch. Spectacular! What a great guy that Ben is. More on this history making session as it develops. Entertainer Of The Year 2011! What the heck is The Old Sheepherders Party? The wildly popular and hip Canadian sitcom "House Party" has contracted with Sourdough Slim to use his fabulous, self-penned classic "I Just Yodel My Troubles Away" in they're upcoming season. The song is scheduled to be featured in at least one episode and in the end credits of five more. Also scheduled to be featured in one episode is his fantastic yodeling tribute "Yodelin' Bill." Those Canadians are obviously at the forefront of cool new trends. In any case we're happy to add a new dimension of fun. Stay tuned for more. On the heels of 2007's tremendously popular "Classics" CD comes "Classics II". 15 epic renditions of some of the greatest cowboy songs of all time. "Classics II" features more of the classic cowboy hits that made the first one such a must have CD. Song titles include; "Rawhide", "Chime Bells Yodel", "Ridin' Down The Canyon", "Mule Train", "Silver On The Sage", "The Strawberry Roan", "Twilight On The Trail" and 8 more. 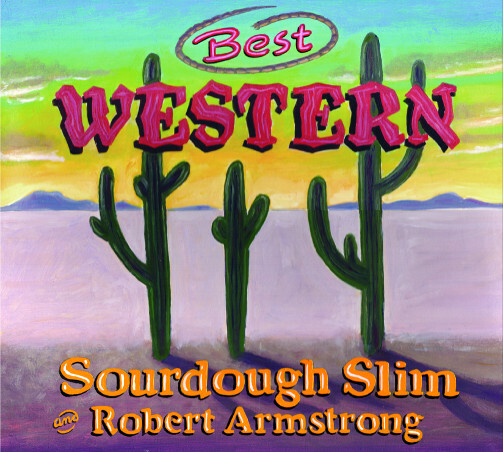 These gems come alive again with the unique treatment of the Doughmeister backed by some of the best cowboy musicians in the West. Order yours today. Send $15 ppd. check or M.O. to: Sourdough Slim, PO Box 2021, Paradise, CA 95967. More details about this great new CD on the CD page of this website. In November, Sourdough Slim found himself in Death Valley where he was performing at the annual Death Valley 49ers Encampment. While there he met up with world famous celebrity photographer Vern Evans for a masterfull photo shoot. Evans has been the artist behind the camera in photo shoots with some of the biggest celebrities and stars of Hollywood and beyond. Some of his clients include Forbes Magazine, Disney, Sony, Turner Broadcasting and HBO to name a few. Check out these exciting new photos on the "Photo Page" of this website. 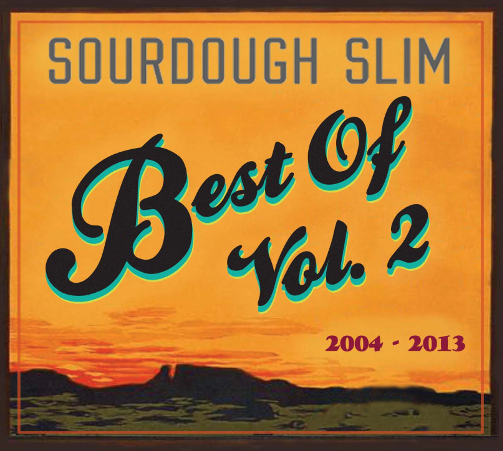 Sourdough's 2004 release received high marks from fans and reviewers alike. Steeped in the traditions of such early country music pioneers as Jimmie Rodgers, Tex Ritter, Frankie Marvin and Carson J. Robison, Sourdough Slim puts his own unique brand on 16 classic and original songs on this new recording. Accompanying himself on accordion, guitar, harmonica and baritone ukulele, the lively tracks on this CD bring back the romance and feel of an era when cowboy music was in it's heyday. 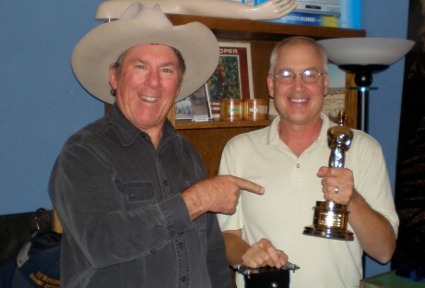 Top it all off with the award winning yodeling that earned him the Academy of Western Artists Will Rogers award for "Yodeler of the Year" and you have one great tribute to the wild and woolly West. Sourdough is joined on several tracks by John Girton of "Dan Hicks Hot Licks" fame and long time cohort Pam Laughlin on clarinet. The album is dedicated to legendary border radio pitchman and yodeling cowboy, Dallas Turner (Nevada Slim), who starts the whole thing off with one of his famous carnival pitches and closes the CD with a side show bark he used while working 1940"s carnivals. Order yours today. Check the CD page for details. 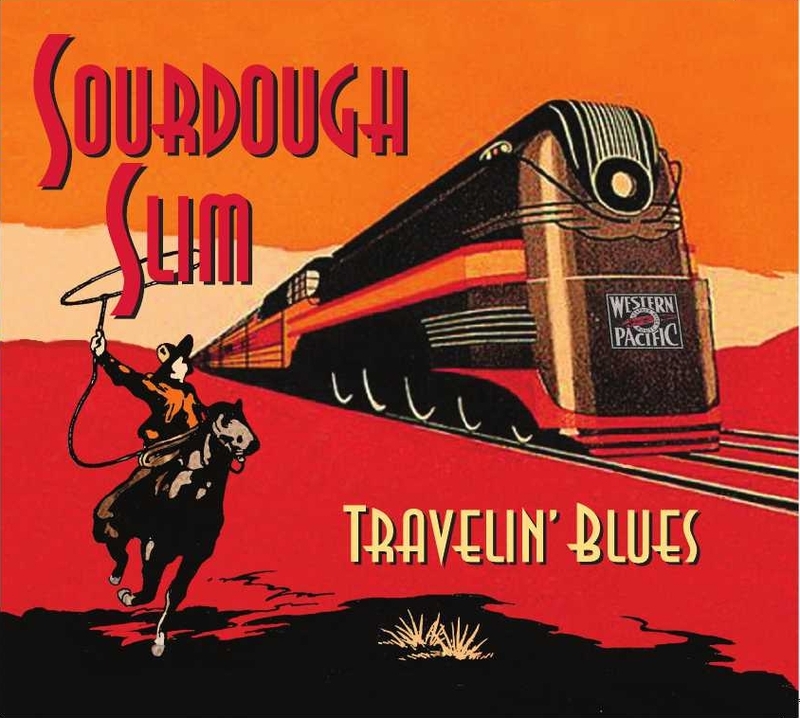 In early December Sourdough Slim joined the Western Folklife Center in an exchange of cowboy culture with the Gauchos of Brazil and Argentina. Sharing the stage with Wylie & The Wild West and famous Gaucho musicians, he entertained at sold out shows in Porto Alegre and Buenos Aires. In Porto Alegre, Sourdough and Wylie were crowned honorary Gauchos as the enthusiastic Brazilian audience went wild with a standing ovation. The language barrier was further broken down by the dynamic yodeling of both performers and the uproarious physical comedy of the "Doughmeister." All told, it was a proud moment of respect, appreciation and understanding between two like cultures from opposite hemispheres. Hats off to The Western Folklife Center, Boojum Expeditions, our South American hosts and translators, including Sr. Luiz Carlos Borges and the Institute of Gaucho Traditions & Folklore, Armando DeFerrari, Sr. Pablo Loranzo, Country2.com, Gabriel Gratzer and the wonderful entourage of traveling companions that made this cultural exchange possible. For more info check out: www.westernfolklife.org, www.boojum.com & www.wyliewebsite.com. Make plans to attend the fabulous National Cowboy Poetry Gathering in Elko, Nevada January 26 through February 2, 2008. 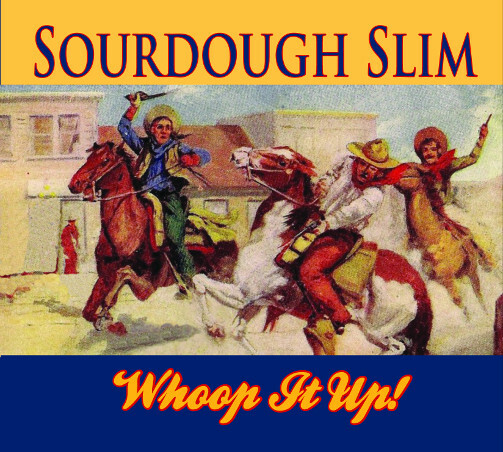 Sourdough Slim will be there entertaining as well as many of the top cowboy poets & musicians from around the country. For four days and three nights in November, Tom Russells' Cowboy Train barreled across Canada from Vancouver to Toronto. 75 passengers on this "festival on wheels" were royally entertained by the likes of Tom Russell, Michael Martin, Sourdough Slim, Wylie & The Wild West, Rosalie Sorrels and Stephanie Davis. Aboard the vintage 1950's streamliner passenger train the good times never let up as the entourage rattled up and over the grandeur of the Rocky Mountains and across the vast prairies, lakes and woodlands of our neighbor to the north all to the accompaniment of some of the greatest roots music of our time. A grand adventure like none other. Thanks to Tom Russell and Charlie Hunter, the mastermind behind Roots On The Rails. For more info go to www.rootsontherails.com & www.tomrussell.com. Catch up with you on down the trail.